First of all, let me just say that if you don't want to spoil this joke for yourself until you see A Million Ways to Die in the West (hitting theaters in one week), then you won't want to read after the jump. We all know Seth MacFarlane is the king of pop culture references now from the endless cutaway gags on "Family Guy" to last year's inclusion of references to Airplane!, Flash Gordon and Indiana Jones in his directorial debut Ted. However, when it comes to his latest western comedy, that might be less possible considering the setting, despite the contemporary feel of the film. But there is one brilliant pop culture reference that has been revealed, and we're a bit mad that it's been spoiled early on. You've been warned! Yes, that's Christopher Lloyd as Doc Brown and the DeLorean time machine is behind him (though to nitpick, it's not actually the one from Back to the Future Part III. 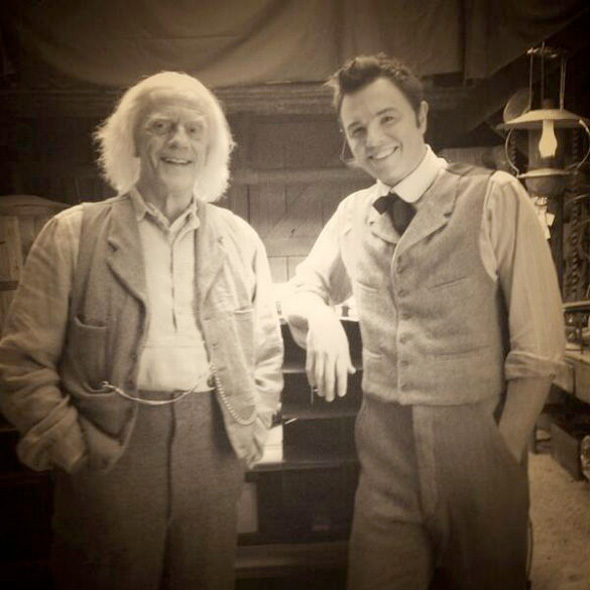 MacFarlane's character walks over to a wooden shed with strange blue light flashing inside, and stumbles upon Doc doing some work on the time machine. It's a shame Michael J. Fox didn't get in on this scene, but maybe he shows up later? This is probably the most logical and best contemporary pop culture reference that can be made while staying true to the film's setting, and it's such a bummer that it's been spoiled in the marketing. This would have been a great surprise, but maybe Universal is anxious to get some butts in the seats who otherwise might not have been interested without this joke (which would be weird). Anyway, as fans of MacFarlane, we're sure there's plenty other great jokes that haven't been shown in the most recent red band trailer or tamer green band trailer, but this reference to Back to the Future is one that made me laugh hysterically, but then immediately filled me with regret when I realized it had been spoiled. A Million Ways to Die in the West is directed by Seth MacFarlane and written by "Family Guy" collaborators and Ted co-writers Wellesley Wild and Alec Sulkin.After a cowardly sheep farmer (MacFarlane) backs out of a gunfight, his fickle girlfriend leaves him for another man. When a mysterious and beautiful woman (Theron) rides into town, she helps him find his courage and they begin to fall in love. When her husband, a notorious outlaw, arrives seeking revenge, the farmer must put his newfound courage to the test. Charlize Theron, Neil Patrick Harris, Amanda Seyfriend, Sarah Silverman, Giovanni Ribisi and Liam Neeson also star in the film which Universal Pictures will release in theaters everywhere on May 30th, 2014. Well? i am on the fence with this one, i want to see it for the laughs but dont want it to be to crude. probably wont see it but the laughs in the trailer have been good. The movie is terrible. I saw it last week. They are desperate for butts in seats. DESPERATE. I think Seth is hilarious, but his acting ruins his own jokes. I saw this a few weeks ago and I quite enjoyed it. It's not absolutely hilarious but I did laugh quite a bit. Yeah it's a shame the Doc Brown joke was ruined in the trailers. It would have been perfect if they didn't reveal this in the trailers because that was pretty much the entire scene they showed. What does Christopher Lloyd say in the end? I can't make it out. I can't make out what he says either. Thank you. That was bothering me. I'm sorry but I can't take anyone that finds Seth funny, seriously. I want to thank the idiot who spoiled this...by NOT watching it until it's on cable. Is he saying Mila Kunis, Mila Kunis during the campfire scene?